Since his philosophical ideas are refreshingly new, counter-intuitive, and mind-boggingly deep, I decided to re-read all four of Nassim Taleb’s books. I just finished re-reading “Antifragile” and am now well into my second pass through “The Black Swan“. As with all good books that resonate with me, I find that re-reading them brings new learning, excitement, and joy. It’s almost like I’m reading them for the first time. The reason I’m magnetically drawn to Mr. Taleb’s work is because his mission is truly noble and humanitarian. It is to make the world a better place by creating a system in which so-called elites (e.g. economists, politicians, academicians, Harvard-trained managers, high frequency traders) with no “skin in the game” cannot harm millions who follow their predictions/advice/policies without being harmed themselves. Requiring big-wigs to place some “skin in the game” (Mr. Expert, does the content f your portfolio align with your forecasts/advice?) precludes the alarming and increasingly asymmetric transfer of anti-fragility from regular Joe Schmoes like you and me to smug, self-serving elites. In case you are new to the concept of antifragility, consider the figure below. A fragile system is one in which, as the magnitude of an external stressor is applied, the harm it experiences increases non-linearly. 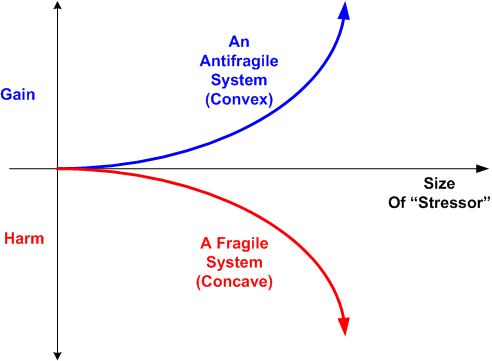 An antifragile system is the exact opposite. It is more than simply resilient or robust. It actually gains from volatility (up to a point, of course). Since you can’t know what’s going to happen in the next five minutes, let alone far into the future, you can’t guarantee your own personal antifragility. But you can take concrete action to reduce your fragility and minimize the risk of someone stealing whatever antifragility you do have. Eliminating debt decreases fragility. Adding redundancy (e.g. two kidneys, two lungs) and “having options” reduce fragility. Government bailouts transfer antifragility from taxpayers to executives and shareholders. Lack of term limits transfers antifragility from voters to politicians. Corporate mergers and buyouts transfer antifragility from employees to executives. Increasing size and centralization increases fragility. Lack of exercise increases fragility. Long periods of obsessively manufactured stability increase fragility. The ultimate fragilizer, and the one in which we can only accept, is…….. TIME. I’m in full agreement. May be I shoud re-read all his books, they were certainly engaging, which is more than I can say for most of the science books I read. I think Nassim Taleb is in a class of his own, being alligned with the humanities, a philosopher at heart, and well read, in a wide range of subjects, he is able to look at things from a holistic point of view. 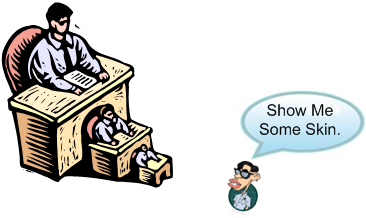 His credibility resonates because he is not from the off the shelf specialists, and scientists, who too often fall into the group-think containers.